On 19 September 1942, Max and Frieda Müller were deported with six other Jews to Theresienstadt Ghetto: Meta Krakauer, née Frankenberg; her sister-in-law, Klara Frankenberg, née Bauer; Hugo and Klara Grünbaum, née Schloss; Max and Frieda Muller, née Freudenberger, and Markus and Else Rosenberg, née Kahn. 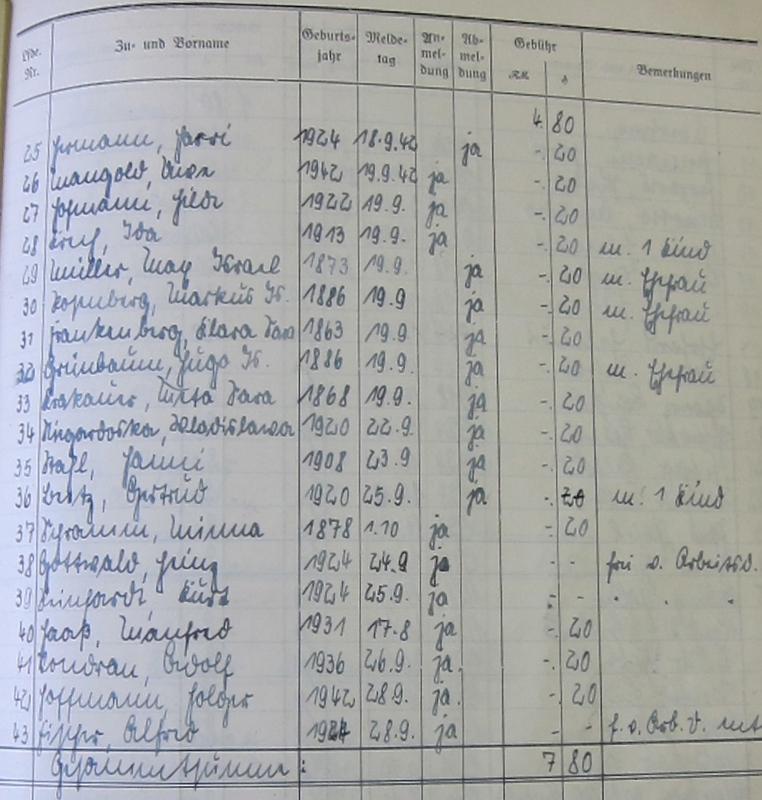 Their departure from the town was noted in the normal manner in the City Register (at right, Ordner 109 in the City Archives) and they each paid an administrative fee of 20 pfennig. The group was initially transported to Weimar and there herded into a train with 357 other Jews of Thüringen. Other family members, identified on the map below, joined the transport at this point. On 20 September 1942, they set off for Theresienstadt; 520 Jews joined the transport in Leipzig. The deportation train, which now included a total of 23 members of Themar’s Jewish families, stopped in Bauschowitz as the ghetto itself did not have a train station until the summer of 1943. The prisoners had to walk the three-kilometer stretch to the ghetto on foot and under guard. 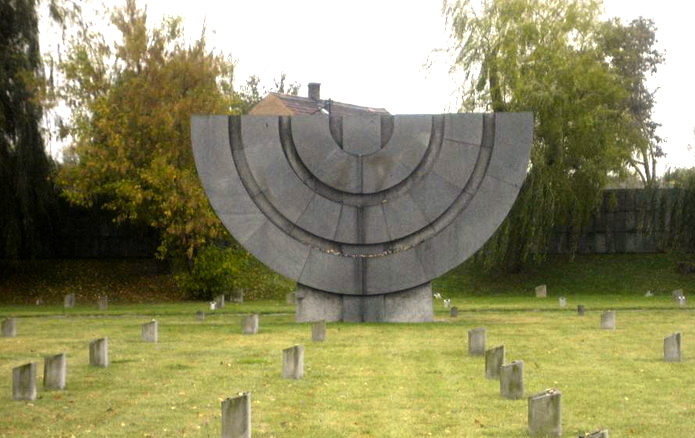 Between 26 June 1942 and February 1945, 67 Jews connected to the families of Themar were transported to Theresienstadt Ghetto from various other places in occupied Europe: Germany, Czechoslovakia, and Holland. The first were Georg and Rudolf Gassenheimer, both born in Themar, with their wives, sisters Selma and Thekla Schwab of Berkach. 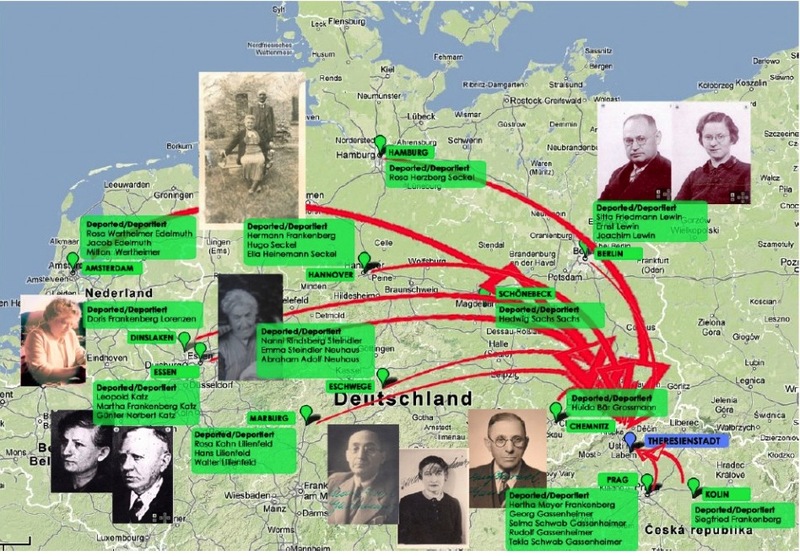 The two Gassenheimer couples had left Germany for Prague in 1938 hoping to escape the Nazi terror but it had followed. The last people to be taken to Theresienstadt Ghetto were those who had been protected earlier by their position within a so-called ‘privileged’ marriage or as the children of Jewish/non-Jewish parents. Rita Dressel of Hildburghausen, members of the family of Salomon and Karoline Müller, and her two children were ‘safe’ until August 1944, but were then sent to Theresienstadt. Gertrud Heim, Rita’s sister, also married to a non-Jew, was deported on 31 January 1945. The last of Themar’s Jews, Doris Lorenzen, née Frankenberg, b. 1898, lost protection of her ‘privileged’ marriage in September 1944, when she was probably arrested and imprisoned in a large camp in Kassel-Bettenhausen from fall 1944 until early spring 1945. On February 14, 1945 — just 11 weeks before the liberation — Doris, age 46, and three other Dinslaken women of Dinslaken in similar marriages were deported to Theresienstadt. 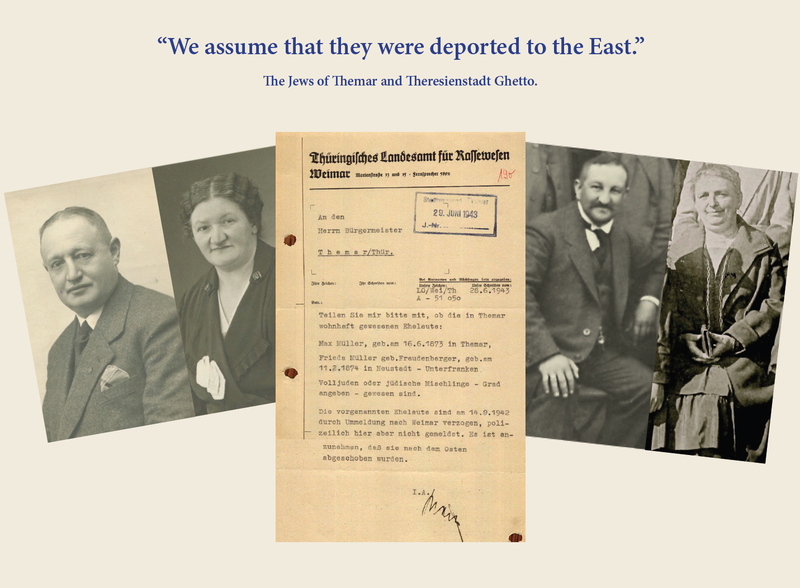 Members of Themar’s Jewish families deported from elsewhere in occupied Europe, 1942-1945. Credit: C. Davis. both of whom died in November 1943. In September 1943, the first two Themar Jews were transported to Auschwitz and nineteen (19) more followed in 1944. 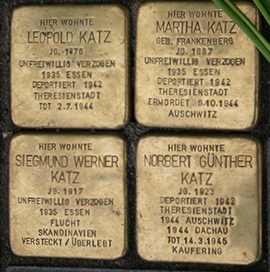 Five were women such as Else Rosenberg, née Kahn, who was taken to Auschwitz after the death of her husband, Markus, simply to be murdered there immediately rather than wait for her death in Theresienstadt. Of the sixty-seven (67) people deported to Theresienstadt who had a connection to Themar, nine survived: with one exception, they were all women and with two exceptions, they all remained in Germany after the war. Fourteen-year old Walter Dressel was the male survivor; a descendant of the S. M. Müller family, he lived the rest of his life in Greifwald, where he died in 2012, age 81. Other members of his family also survived: his mother, Rita Dressel, his sister, and his aunt, Gertrud Heim. Rita Dressel and Gertrud Heim remained in Germany, settling in the western zone. Doris Lorenzen, the other late arrival, also survived. 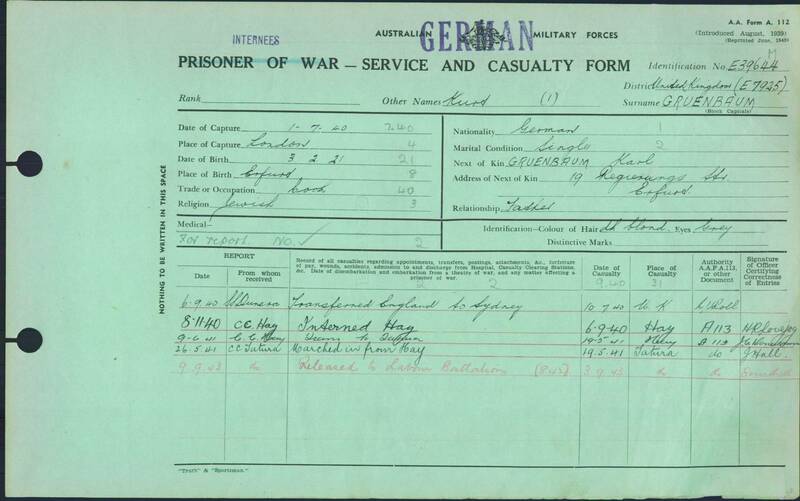 She took her 77-year-old aunt, Meta Krakauer, née Frankenberg, home with her to Dinslaken. Meta died there in 1955, age 87; Doris in 1970, age 74. Minna Frankenberg, née Gassenheimer, related to Doris and Meta through marriage, returned to Halle/Saale where she had lived before the war. She died there in 1961, age 73. Hulda Grossmann, née Bär, a granddaughter of Samuel & Jette Baer, died in Berlin in 1948. Two women left Europe: Helene Gassenheimer, née Hirsch, first went to Düsseldorf to live with her daughter but then moved to California to live with one of her two sons. Hulda Grünbaum, née Schlesinger, was in Switzerland at war’s end, freed as part of a 1000-prisoner-exchange in February 1945. After the war, she kept going — with her daughter, Ilse — to Australia where her son, Kurt, had decided to settle, having been sent there as an “enemy alien” by the British in 1940. MEMBERS OF THE JEWISH FAMILIES OF THEMAR WHO WERE DEPORTED TO THE THERESIENSTADT GHETTO, 1942-1945. Siegfried SCHWAGER (first cousin of Emma, Pauline, and Max Steindler), b. 1878 Cham, murdered 20 Mar 1943 Theresienstadt. For more detail, see this table.